During a speech at Johns Hopkins University in January 2018, Jim Mattis, the secretary of defense, unveiled an updated version of a Pentagon document called the National Defense Strategy. After nearly 17 years of war in Iraq and Afghanistan, the new document fundamentally changed the direction of the Department of Defense. Now, the Pentagon is turning its attention to what it describes as a near-peer competition — in other words: China and Russia — and away from the counterterrorism mission. But with the new focus comes a shift in battlefield technology. The strategy calls for updated nuclear command and control, investments in space, and greater integration of cyber. C4ISRNET asked industry leaders to explain how this shift could play out. Individually, their answers are compelling, but together they create a rich portrait of modern warfare. Near-peer adversaries are willing to expend significant resources — both in terms of people and money — to penetrate or disrupt federal networks critical to the security and economic health of the United States. Likewise, near-peer adversaries’ tools and techniques are far superior to those used by more typical criminal hackers. As such, we’re going to see threats against federal networks increase exponentially. In response, federal agencies must defend all their network assets and those of the nation, whether they exist in legacy or cloud environments. Agencies must proactively hunt near-peer adversaries that are attempting to or have already established a foothold within federal networks. These same techniques must also be adopted by operators of enterprise and service provider networks. U.S. Cyber Command and the Department of Homeland Security will need to be prepared to respond in kind if adversaries act against our defense and civilian networks, as well as our national critical infrastructure. Remember that DHS is tasked with protecting the entire country, not just the federal government. To do that, the department must be prepared to respond to cyberthreats to commercial networks. Security automation will be critical. Automation can also greatly reduce the risk of human error, such as the accidental exposure of highly sensitive data to potential bad actors. Agencies will also need increased visibility into all aspects of their network environments. Near-peer adversaries’ attack methods are growing increasingly sophisticated. They may target applications, devices or other means, and are motivated to find vulnerabilities that CIOs may not even realize exist. Federal IT professionals must have tools in place that allow them to identify and remediate those vulnerabilities and quickly react to potential threats. Imagine the USS TEXAS approaches the coast of a foreign harbor. The ship slows to near-hover, and from one of its torpedo tubes emerges a swarm of 30 Iver-PW unmanned underwater vehicles. They swim out, then spread into a pattern equidistant in lateral distance and depth, autonomously station-keeping. They scan the ocean volume for bottom, moored and floating sea mines, reporting mine detection in real-time. After completing the deep survey, they continue on to perform hydrographic survey of the beach to prepare for an upcoming Marine amphibious landing. The entire operation is done within six short hours. Before this technology was available, the process would have taken 100 divers over three weeks to perform comparable surveys. Not far away, an extra-large underwater drone plants an active sonar projector on the sea floor, which immediately goes active. A series of six medium-diameter Iver-5 unmanned underwater vehicles orbit up to 30 miles away carrying passive receivers, bi-statically tracking four adversary submarines in the area. Further out to sea, one of 50 deployed Bloodhound unmanned surface vehicles is guided to a target datum by shore-based antisubmarine warfare command-and-control forces. A HELRAS dipping sonar is automatically lowered through a moon bay on the Bloodhound, immediately detecting the target, a cruise-missile firing submarine. The USV then reels in the dipping sonar, autonomously repositioning, then dips its sonar again and starts pinging, regaining track. 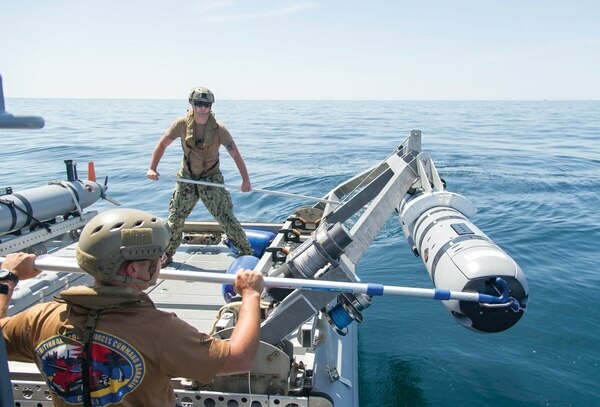 This Bloodhound USV is able to track the submarine for weeks, until hostilities begin and a P-8 Poseidon aircraft outfitted with an MX-20HD electro-optical sensor system is dispatched to launch a torpedo and destroy the submarine from standoff range. More resilient multidomain drone systems could benefit ISR needs. 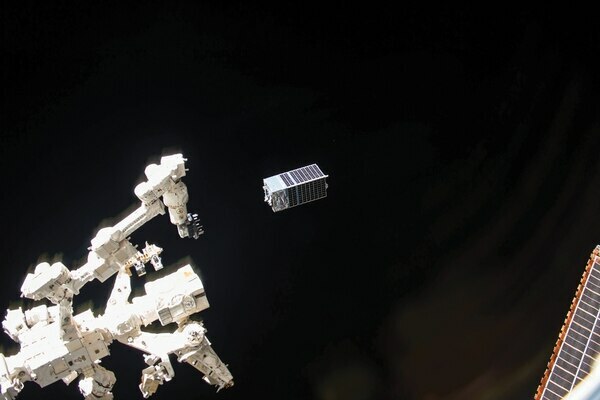 The DoD’s new national defense strategy places even greater emphasis on the urgency for enhanced threat awareness in space, along with the protection of critical assets, both military and commercial on orbit. In contrast to insurgents in the Middle East, a near-peer adversary is more organized, strategic and state funded, and thus positioned to engage aggressively across multiple domains. Indeed, a future conflict of this nature would likely involve troops and unmanned assets on the ground, in the air and at sea; satellite jamming incidents; on-orbit threats; and state-sponsored cyber intrusions targeting electric power grids, nuclear plants and other critical infrastructure across the globe. 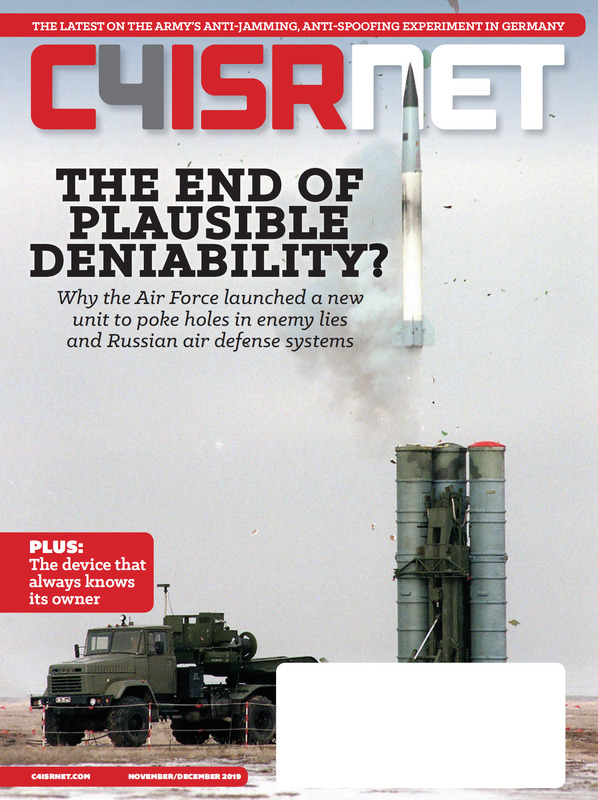 The National Defense Strategy asserts that an attack on critical components of the U.S. space architecture “will be met with a deliberate response at a time, place, manner and domain of our choosing.” In support, the space industry’s focus must be on the broadest areas of support for C4ISR, for both military and commercially supplied satellite communications platforms. This means continued investment into wideband and additional, protected communications, network diversification, backhaul performance, Overhead Persistent Infrared technologies and enhanced augmentation for GPS. This new strategy shifts focus of some mission sets to support advancements in maritime and aeronautical ISR and other highly mobile tech demanding of resilient SATCOM. The adversaries here are not “new,” but their tactics and capabilities have and will continue to evolve and expand. To respond, commercial, defense and intelligence assets must prepare to deter, detect and defend against these threats — whether on land, in the air, at sea, space and cyberspace. Past counterterrorism operations revealed the difficulties of fighting an asymmetric battle with a determined, cunning and agile adversary. Insurgents leveraged commercial technology, including cellphones and social media, for battlefield coordination and off-the-shelf components in improvised explosive devices. This use of easily accessible technology stressed the defense acquisition pipeline. Solutions required disproportionate investment and continued to be countered at great cost. In concert with explosive demand in consumer products, radio frequency microelectronics and processing components are continuing to evolve and grow with no sign of slowing down. Additionally, the hardware is becoming more and more defined by software, enabling flexibility with minimal cost impact. The defense technology acquisition pipeline wasn’t designed to keep up and that is not necessarily the case for near-peer competitors. The DoD and industry needs to and can move faster. Due to long acquisition cycles and a lower historical priority, the technology disparity is extremely evident in electronic warfare. Advancements in off-the-shelf software-defined systems enable waveform flexibility and agility where parameters can be changed between transmissions. Agility means uncertainty, driving us toward the development of cognitive, adaptive and coordinated EW systems that can adjust to counter new and emerging threats. 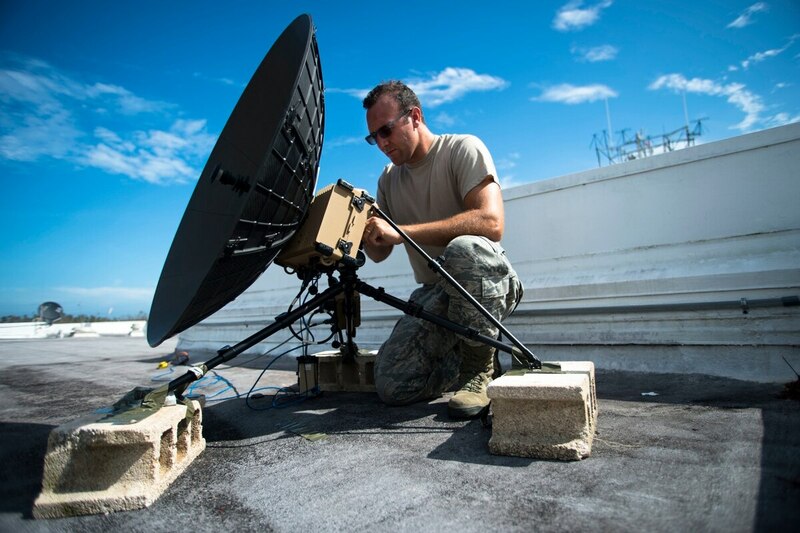 Key innovations in those systems are required to not just keep pace with the commercial capabilities, but also to provide an edge over the near-peers who will be leveraging that technology and have been investing heavily to disrupt our command of the electromagnetic spectrum while the U.S. focused on the counterterrorism mission. With a renewed focus on near-peer adversaries, the Department of Defense has reprioritized EW technology development. The next generation of electronic warfare technology will not be dulled by a peer’s ability to leverage commercial technology, a lesson learned from IEDs many years ago. Satellite imagery could play a critical role in understanding China and Russia. WHAT THE PENTAGON WILL WANT: Machine learning to process giant imagery libraries. One area that’s become increasingly important is the ability to derive intelligence and insight from volumes of data that are far larger than what human analysts can process naturally. Machine learning in the last few years has reached the point where it’s become an effective massive force multiplier, allowing talented and highly trained analysts to focus their efforts on the places and things that are most likely to have mission significance. This is important because the relevant geographies are now larger than ever, and the adversaries are more capable. In the 1990s, you had to know where to look. In today’s world, it’s not the stuff you know about that’s going to hurt you — it’s the stuff you don’t know. So, you basically must look everywhere. We’ve greatly expanded our ability to collect imagery to the point where DigitalGlobe is now producing on the order of 80 terabytes of imagery product every day. It would take a single human analyst 85 years to extract just one single feature from that volume of imagery. Fortunately, the tools to exploit this deluge of data have also been advancing very rapidly, enabling analytic results that might otherwise have gone undiscovered because there just aren’t enough eyeballs in the world to look at every pixel that’s being collected. Unconventional warfare is becoming the new normal. As technology evolves and data to decision speeds are increased, the need for a distributed edge cloud architecture or tactical cloud is a must. The tactical cloud is an operating environment where information, data management, connectivity and command and control are core mission priorities. To best meet the challenges of future peer and near-peer actors, we must exploit all aspects of fused ISR from multiple assets and leverage technology in secure communications. Quickly capitalizing on the capabilities of the ever-changing information age will allow our forces to seamlessly share situational understanding across C4ISR systems in every domain. Near-peer actors have highly effective communication denying capabilities, putting our reach back at risk, thus dislocating the edge teams. This is why a hybrid cloud concept with local tactical cloud applications that can run disconnected from reach back cloud infrastructures is so vital. Even though the multidomain tactical/edge cloud has external connections, the cyber threat is reduced or mitigated through the connections to the edge and theater-level secure gateways. The tactical/edge cloud model is where every platform is leveraged as a sensor. This vision will enable more rapid, effective decisions and will provide a significant operating advantage. A distributed, self-healing, multidomain tactical/edge cloud that is difficult to penetrate significantly complicates an enemy’s pursuits and will force the enemy to focus more resources toward its own defense and offense. In its desired deployment, the tactical/edge cloud will strategically sever the enemy and will lead to and enable multidomain superiority.